This small form factor PC from Shuttle is branded a gaming machine but, at 6.9kg, weighs less than many big laptops. Its diminutive size has drawbacks if you intend to upgrade it (there is only one free PCI slot and one mini PCI Express slot) and it also costs a lot compared with bigger gaming PCs. 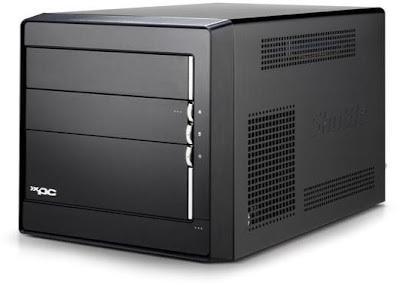 The P2 3500G is based on Shuttle’s SP35P2 Pro barebone chassis, which uses Intel’s P35 chipset. Shuttle pairs this chipset with just one PCI Express slot, unlike its X38 big brother, which makes it more affordable, but it retains most of the features and performance of the X38 to make it one of the best Shuttle barebones around. Intel’s low-end quad-core – the Core 2 Quad Q6600 – is present, along with 4GB DDR2 800MHz Cas5 Ram and a 750GB hard disk. The included Windows Vista Home Premium 32-bit can only access 3.3GB of Ram – the 64-bit variant is not an option. The CPU is Intel’s G0 stepping, which has the same multiplier as Intel’s expensive QX6850 CPU and means it’s easily overclockable to 3GHz (often without a voltage increase) by simply flicking the front-side bus from 1,066MHz to 1,333MHz. The 3500G’s Bios didn’t respond well to being overclocked, though, crashing when we used the auto-overclock options and booting into Windows at 2.4GHz even when the Bios claimed it was at 3GHz. The Bios goes completely against tradition by referring to a millivolt offset rather than the whole of the voltage across the processor, but since overclocking invalidates warranties, only enthusiasts will be disappointed by the 3500G’s intricate Bios. Graphics are handled by an ATI Radeon HD 3870 with 512MB of 2.25GHz GDDR4 Ram, which is the fastest ATI graphics card with one GPU. It’s not as fast as Nvidia’s 8800GTS, which is a better card for the most serious gamers, but it does draw less power. Combined with the 80 per cent efficient 400W PSU, the total system drew 95W when idling – an outstanding result for a gaming branded system. Performance was good throughout, scoring a beefy 8,597 in PCmark05, 7,699 in the CPU section and a decent 1,296 in Cinebench’s multi-CPU test. Where gaming prowess is concerned, the 3500G scored 20fps (frames per second) in our intensive DirectX 10 World in Conflict benchmark at 1,920x1,200, with high detail settings enabled. Only when we lowered the resolution to 1,680x1,050 and used medium settings was the game playable, averaging 46fps, so a 22in monitor is probably the P2 3500G’s best companion. The P2 3500G, like most Shuttle computers, does a good job of home theatre PC tasks. There’s no remote control, but there is 802.11b/g Wifi fitted neatly inside the chassis. The back of the case presents a feast of ports, while three sleek, black front doors reveal a DVD writer, a multiformat card reader and a connectivity panel, respectively. The connectivity panel has a fingerprint reader, headphone and microphone jacks, a mini Firewire port and two USB ports, while a Speed-Link button gives one USB port networking functionality. A USB cable is supplied, with a male plug either end, which, when connected to the Speed-Link-enabled USB port and another PC activates a 480Mbits/sec network connection between the two. It’s hardware-driven, so there’s no need to install any drivers on either system. If you can stomach the £200 price compared with a bulkier Dell XPS gaming machine, and don’t plan to overclock, then this is a list topper.